Honest to goodness I was hoping to have more posts for this week, but it just didn't happen. How about a little recap instead? Great. Most of our last weekend was spent taking Izzy to the doctor and trying to find her prescriptions. I know, you are probably in the dark as to why Izzy went to the doc again. Well Izzy is feeling much better. No fever's or anything, However, she still has a cough she cannot kick. This couch has gone on for over 3 weeks now. 3 Weeks of very little sleep and lots of coughing spells that throw her into vomiting and bloody noses. The Pedi thought that her lungs are trying to heal after her viral cold and that maybe she picked up a temporary case of Asthma. Asthma like this is often temporary until the lungs can heal. So, Izabel was put on an inhaler and Zyrtec everyday until the cough is gone. The cough has not gotten the slightest bit better. On Tuesday we went back to the doctor to have her cleared for surgery. All of her pre-surgical tests came back great and she is good to go tmrw. But, while we were there the Pedi reevaluated her cough and decided that not only should we continue the regimen we are on but to add Singular too. We did and have seen no results as of yet. The doctors are concerned but are still unable to determine if this is a temporary form of Asthma or the start of chronic symptoms. We will know more as the days go by and the medicines either work or don't. I tend to lean more toward a temporary situation rather than the start of chronic Asthma. Tmrw is Izabel's dental surgery. Please keep her in your thoughts and prayers. She too will undergo this surgery while completely under with Anesthesia. Remember how worried we were last week? Emily is doing great and her cold is all gone. She's back to the best sleeping baby ever and happy as can be during the day. She's talking up a storm too! Can you believe that I have missed her 10 and 11 month birthday updates? Yeah, I've been that unorganized. I am still going to try and get one posted before her big first birthday next week, but I am not making any promises. Emily can say about a dozen words and has really picked up signing too. She's mastering new skills very quickly as well. She has her one year birthday photos scheduled for this Saturday but she kinda scratched her cheek a little bit last night and I am not sure how it's going to look by Saturday. If it's still noticeable than I may postpone them until next weekend. It's nothing major, she just tripped up last night. It's more of a redness than a scratch, but still, Princesses must look their best while in front of a lens. As for Daddy and I, well we've been busy. We have so many little things we are trying to accompolish and still manage the big stuff. One exciting piece of news is that we have decided to take the girls to Florida after the New Year. It will only be a week long trip but it will be nice to get out of the wintery temps of the midwest. Daddy has to be there on business but the girls and I will be tagging along. We'd love to be able to go to the beach and play in the sand but we've also been looking into stopping by the Magic Kingdom as well. "Looking into" are the key words. The girls would be able to get in Free, but holy cow, the adult prices are kind of expensive! You would think that it being an off season they would be cheaper. Um, No. We will be in the Tampa area and we are both unfamiliar with that area. If any of my lovely readers have any additional information or inexpensive activities, I'd love to hear your thoughts and ideas. You can leave it in the comments section or you can email us! Well that about sums things up around here lately. We are of course are trying to prepare for Emily's birthday party next week, Thanksgiving and Christmas. So much to do and so little time to accomplish it all. I apologize if I haven't been by your blog in a few days (or more). I try to stop by a few each day but I know I have missed quite a lot. Thank you for being so patient and, with my fingers crossed, I'll be able to enjoy my blogging world more in the coming days. One last thing before I go. The magnificent Chris over at Life...Or A Reasonable Facsimile Thereof has presented Izzy 'N Emmy with some bloggy love. Chris is a husband and father of 3 children. His photos are breathtaking and I can assure you, Awesome! Not to mention he makes for a great Indiana Jones. Hop, Skip or Jump over and visit Chris. You'll be in awe of is photos and his words. *Write about five things I love and make five other people do the same. 1. I love my husband. He is my lifeline, protector and provider; My best friend. 2. I love our girls, Izabel and Emily. They are the best girls ever and remind me everyday to enjoy the simple things, to laugh, smile and never forget hugs and kisses. 3. I love my family, all of them. 4. I love my photos and all they represent of the past and the sneak peek they give me into the future. 5. I love helping others and bringing a smile to someone who may have forgotten how to smile. Hugs on the dental work. Carson also takes Zyrtec and Singular. The Zyrtec is more for allergy type symptoms and Singular is used more for his Asthma. The asthma doctor told me that the Singular can take UP TO 3 months for the full benefits to kick in. Is she on an inhaler or nebulizer? Carson is on both, he takes Advair(used to take Flovent) and Ventloin(used to be Abuterol) through an inhaler and Xopenex and Combi Vent through his nebulizer. We found that the Abuterol caused him to be real jittery and I felt so bad for him after taking it. Oh I hope it isn't asthma because that is where all of our problems began with Carson. He started his wheezing around 7 months. We just had a bad flare up last Saturday and he just had his surgery. I pray everyday that we can either control it or he will outgrow it. Let me know if you need anything or have any questions on any of her meds. We have become quite the pros in my house. Wow, now that is an update. I will be saying a little prayer for Izzy for tomorrow. Hoping that everything goes good. And I sure hope she doesn't have the long term Asthma, from one Asthma sufferer it isn't fun. Glad to hear that Emmy is doing well again. 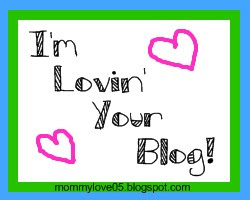 Thanks so much for the bloggy love!! And good luck with Izzy tommorow. I will be thinking of you. First, congrats to you on the bloggy bling. You so deserve it! Thanks so much for the sharing the love! Holy smokes! That's an update. What a busy life -- here's hoping everything goes well, especially with the surgery. Go to Disney World if possible- it's always magical. First good luck with that surgery!! And congrats on your well deserved bling. I'm so honored you even thought of me! Now go take care and rest! thinking of your and sending healthy thoughts your way! So much happening … it’s no wonder you’ve not posted for a few days. I’m Emily’s doing well and hope that Izzy’s on her way to recovery too. You’ll all be in my prayers.